MOSCOW, Russia -- Russia staged a huge May Day parade on Moscow's Red Square for the first time since the Soviet era on Thursday, with workers holding banners proclaiming support for President Vladimir Putin after the seizure of territory from neighboring Ukraine. Putin restores Soviet-era Labor Day celebrations on Red Square. Shown are Russian Communist Party activists during a May Day rally in central Moscow on May 1, 2014. 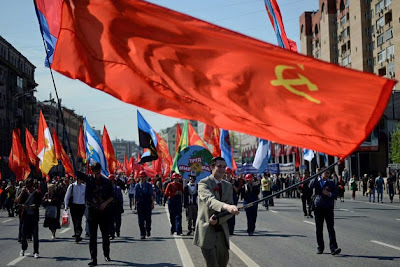 Thousands of trade unionists marched with Russian and Communist flags and those of Putin's ruling United Russia party onto the giant square beneath the Kremlin walls, past the red granite mausoleum of Soviet state founder Vladimir Lenin. Many banners displayed traditional slogans for the annual workers' holiday, such as "Peace, Labour, May". But others were more directly political, alluding to the crisis in Ukraine where Russia's annexation of Crimea in March precipitated the biggest confrontation with the West since the Cold War. "I am proud of my country," read one banner. "Putin is right," said another. In eastern Ukraine, where a number of government buildings have been seized by armed groups seeking union with Russia, the security situation deteriorated further. Separatists stormed the prosecutor's office in the city of Donetsk, throwing rocks, firecrackers and teargas at riot police defending officials they accused of working for the Western-backed government in Kiev. Rebels in the city, capital of a province of about 4 million people, have declared a "People's Republic of Donetsk" and called a referendum on secession for May 11, undercutting a planned presidential election in Ukraine two weeks later. Ukraine's leaders - who came to power in February when the previous Moscow-backed president was toppled after months of protests - conceded on Wednesday they were "helpless" to counter the fall of government buildings and police stations in the Donbass coal and steel belt, source of around a third of the country's industrial output. The International Monetary Fund warned that if Ukraine lost territory in the east it would have to redesign a $17 billion bailout of the country, probably requiring additional financing. Having seized buildings in the capital of the easternmost province, Luhansk, on Tuesday, gunmen took control at dawn on Wednesday in the nearby towns of Horlivka and Alchevsk. Citing the situation in the east, acting Ukrainian President Oleksander Turchinov signed a decree reinstating compulsory military service for men aged between 18 and 25. The Kiev government, along with its Western allies, accuses Moscow of orchestrating the uprising. The United States and European Union have imposed sanctions in response to Russia's annexation of Crimea and involvement in eastern Ukraine. Russia denies having any part in the rebellion, but has warned it reserves the right to intervene to protect ethnic Russians and has massed tens of thousands of troops on its western frontier with Ukraine. The U.S. and EU sanctions, while not hitting Russian industry directly, have hurt the economy by scaring investors into pulling out capital. The IMF cut its outlook for Russian economic growth this year to just 0.2 percent on Wednesday and said Russia was already "experiencing recession". U.S. aluminum producer Alcoa said its Chief Executive Klaus Kleinfeld had canceled plans to attend Putin's St. Petersburg International Economic Forum later this month. A company spokesman confirmed that U.S. officials had urged Alcoa not to send its top executive. Kiev ordered the expulsion of Russia's military attaché on Thursday, saying it had caught him "red-handed" receiving classified information from a colonel in Ukraine's armed forces on the country's cooperation with NATO. A spokeswoman for Ukraine's security service, the SBU, said the attaché had been handed over to the Russian embassy and ordered to leave, though she was not sure if he had left yet. In Moscow, Putin, unlike Soviet-era leaders, did not personally preside at the parade from atop Lenin's mausoleum. But he carried out another tradition from those days by awarding "Hero of Labour" medals to five workers at a ceremony in the Kremlin. He revived the Stalin-era award a year ago. Putin has described the break-up of the Soviet Union as a tragedy and overturned decades of post-Cold War diplomacy in March by declaring Moscow's right to intervene in former Soviet republics to protect Russian speakers. NATO said on Thursday it was looking at ways to bring former Soviet state Georgia, which Russia invaded in 2008, "even closer" to the military alliance. James Appathurai, NATO Special Representative for the Caucasus, said he would not let Russia's words or actions influence the final decision on whether to make Georgia a full member. Moscow strongly opposes Georgia joining NATO. Last week France and Germany assured Georgia that a deal bringing it closer to the EU would be sealed soon. Romania, a former member of the Soviet bloc that now belongs to NATO, called on Thursday for the United States and the Western alliance to boost their military presence in the country. This would promote stability in the Black Sea region and "deter any other destabilizing initiatives", the foreign ministry said in a statement. Moscow mayor Sergei Sobyanin told Rossiya 24 TV that more than 100,000 people had marched through Red Square. "This is not by chance, because there is a patriotic uplift and a good mood in the country," he said from the square. Russian television also showed footage of a May Day parade in Crimea's capital Simferopol, with Russian flags and banners reading "Crimea is Russia. Welcome home." "We are sure that the current patriotic uplift in Crimea will spill over into the whole Russian Federation," Interfax news agency quoted Crimea's pro-Moscow leader Sergei Aksyonov as telling journalists. The intervention in Ukraine has been enormously popular in Russia. One opinion poll on Wednesday showed 82 percent support for Putin, his highest rating since 2010. "Western sanctions won't affect us. Crimea was historically part of Russia, and it's only right that we've become whole again," said Tatyana Ivanova, a worker from Moscow Housebuilding Factory No. 1 celebrating May Day with four colleagues. Putin has also revived the Soviet-era practice of staging massive displays of military firepower on Red Square to mark May 9, the anniversary of the allied victory over Nazi Germany in World War Two and one of the most important days in the Soviet and Russian calendars. Central Moscow streets have been partially closed in recent days as tanks and mobile rocket launchers rehearse for that parade next week.